My sister was in Chicago the week it was very cold and snowy. Miraculously, she got in and she got out. Her flight out of Chicago was much delayed but she got in to Dublin about midday. She then picked me up and drove us both to Cork. I offered to drive, I really did but she has a new car and, secretly, I think she doubts my ability to keep it scratch free. It was lovely to have her to myself for the day even if she was exhausted. We stopped en route for lunch in Kildare Village (my struggles with which I have previously documented). I spent a fiver on lipbalm from Penhaligon which was profligate and €7.50 on a vase from Villeroy and Boch which was definitely a bargain. As we approached Cork, I asked her “Will you go straight to bed when you get home?” “Oh no,” said she, “I have to spend a couple of hours answering emails.” I was suitably horrified by the work ethic expected from her American overlords. “But then,” I said, “then, you’ll go to bed.” “No,” she said, “I’m going to a record launch in Cawlan’s”. “Where?” “Cawlan’s.” “Never heard of it, spell it.” “C-O-U-G-H-L-A-N-S” “Oh,” I said, “Cocklan’s”. “No, Cawlan’s, you’ve just been out of Cork too long, you don’t know how to pronounce it any more,” said she. I let it go, she was driving after having been awake for 36 hours and flown out of a snow bound mid-West. But I knew I was right. Later that evening, my brother asked me would I run him to the pub in the car. “Sure,” said I, “where are you going?” “Cawlan’s.” I am a broken woman. The coda to our logistics last week was getting Herself back to France. She was due to fly out at 9.50 on Wednesday morning. Alas, I did not see some form online which was supposed to be filled in for under 16s [Air France didn’t need one but Aer Lingus did – I know, I know, when you’re explaining you’re losing] and she was thrown off on the steps of the plane. Mr. Waffle had to zoom back to the airport and re-book her for a later flight and then we needed to re-book her train from Charles de Gaulle to the west of France. It was all a bit stressful. She is Miss Super Competent in fairness to her. 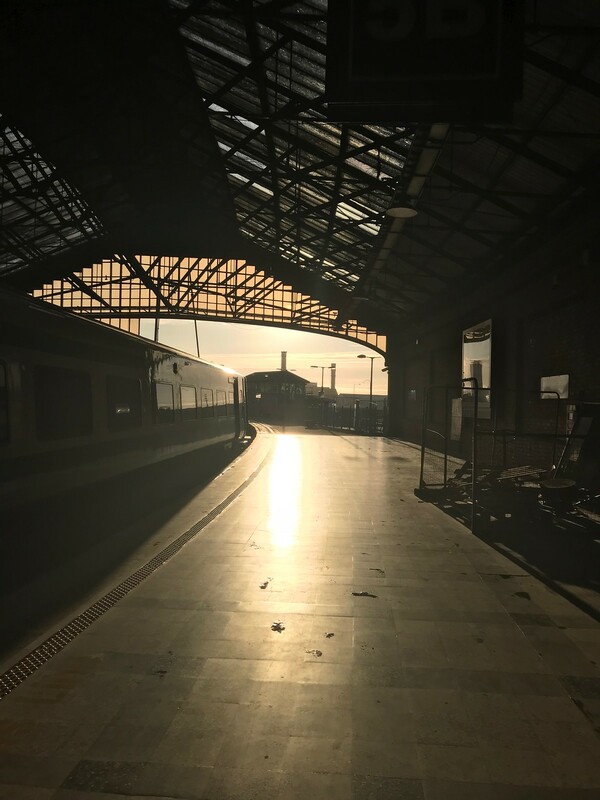 She got on the plane in Dublin and from there, unaccompanied, navigated her way to the train station in CDG and on to the express train back to her host family in the west of France. Poor Mr. Waffle meanwhile spent the morning in the airport (unexpectedly, obviously) and then came home to find that the wretched cat had captured a blackbird and brought it into the kitchen. Mr. Waffle arrived home to a storm of feathers and the bird standing dazedly on the work surface between attempts to hurl itself out the closed window. The cat was pacing the floor frantically some dimly understood precept (or possibly her vast bulk) preventing her from hopping up on to the work surface. Mr. Waffle threw her into the utility room and ushered the bird into the garden. The cat got out the cat flap in the utility room and was waiting anxiously for them at the back door so that escape plan was not entirely successful. The bird got out eventually and we are still finding feathers in surprising places. Joy. Meanwhile it was Halloween in Dublin and for the first time since moving in, our decorations beat next door’s. It could be that now that their children are 19 and 17 they are not trying so hard but I like to think that we really tried. 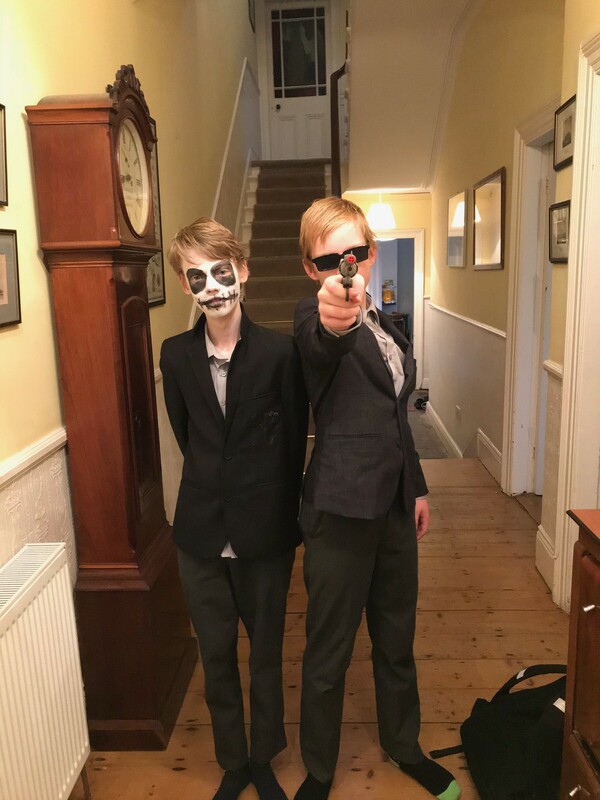 The boys looked very impressive in their costumes but were too sophisticated to go door to door and just wore them for school. We had planned to go to Cork for a couple of days over mid-term before Mr. Waffle’s father died and I wondered whether we should cancel but after some humming and hawing we went in the end. In a new development, the boys stayed in my parents’ house and Mr. Waffle and I stayed with my sister. This was a very satisfactory development for everyone except, possibly, our host. 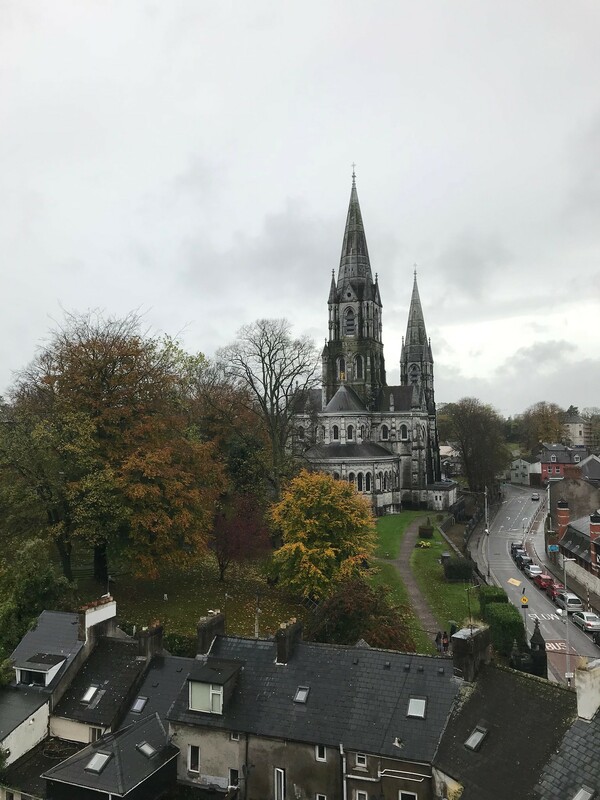 We drove down on Thursday night which was a bit of an epic trek but it did mean that we woke up in Cork on Friday morning ready for a day of Cork related fun. 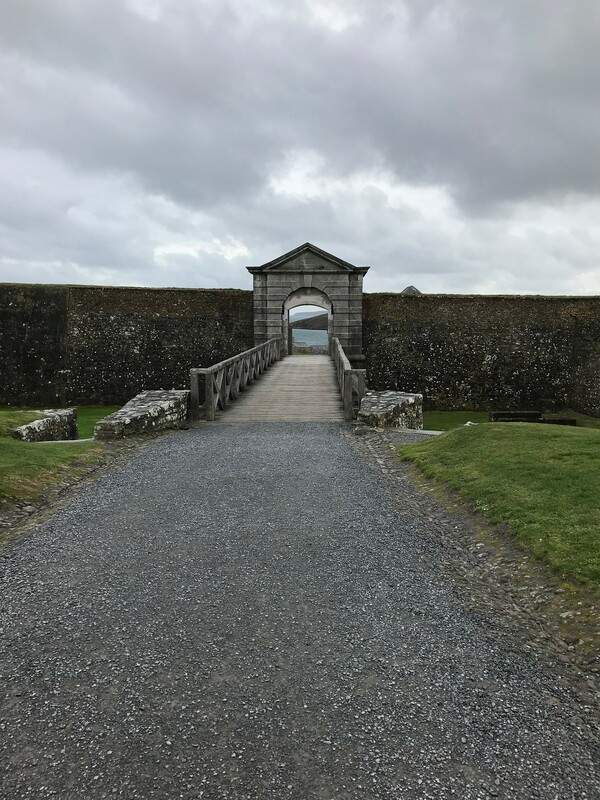 In what can only be called the high water mark of family cultural engagement, the boys said that they wanted to go to Charles Fort in Kinsale on Friday, so we did. It was a bit damp but we missed the worst of the rain. On the strength of this, I bought a new family heritage card for €90 which means that we have to go to at least six heritage sites over the next year to break even. I fear the worst. So do the children. 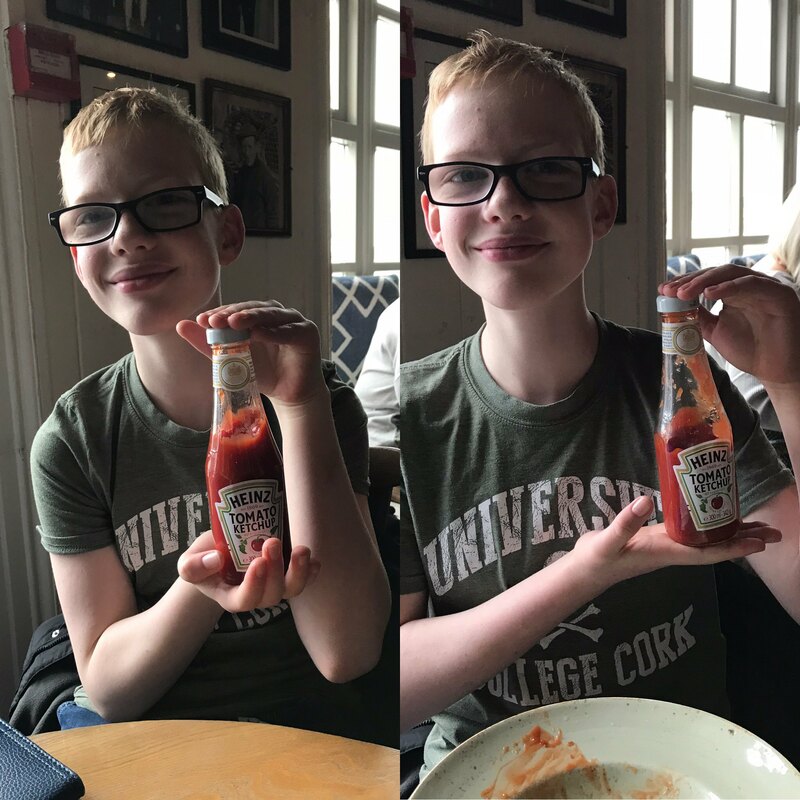 We went for lunch in the Bulman and Daniel took the obligatory before and after pictures of the ketchup bottle to send to his uncle who does not love ketchup. The waitress assured me that ketchup is part vegetable but I am not entirely convinced. 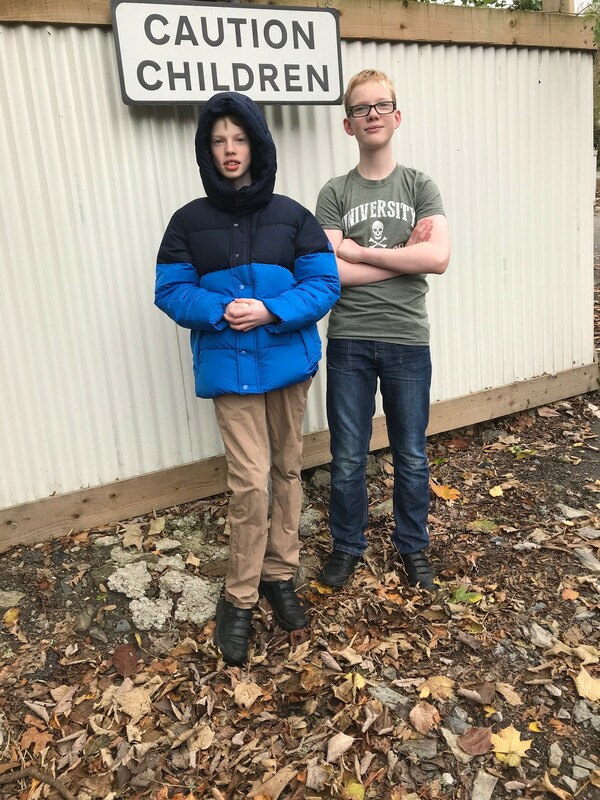 We took the traditional picture at the caution children sign. On Saturday, my brother and sister minded the boys for much of the day (including a trip to Milano’s for pizza, let joy be unconfined) leaving myself and Mr. Waffle to our own devices. We were a bit blinded by the unexpected freedom. We went for breakfast and, after a trip to the Crawford gallery and a mild wander around the town in the rain including a look at food fair in the City Hall, we waddled on to lunch. 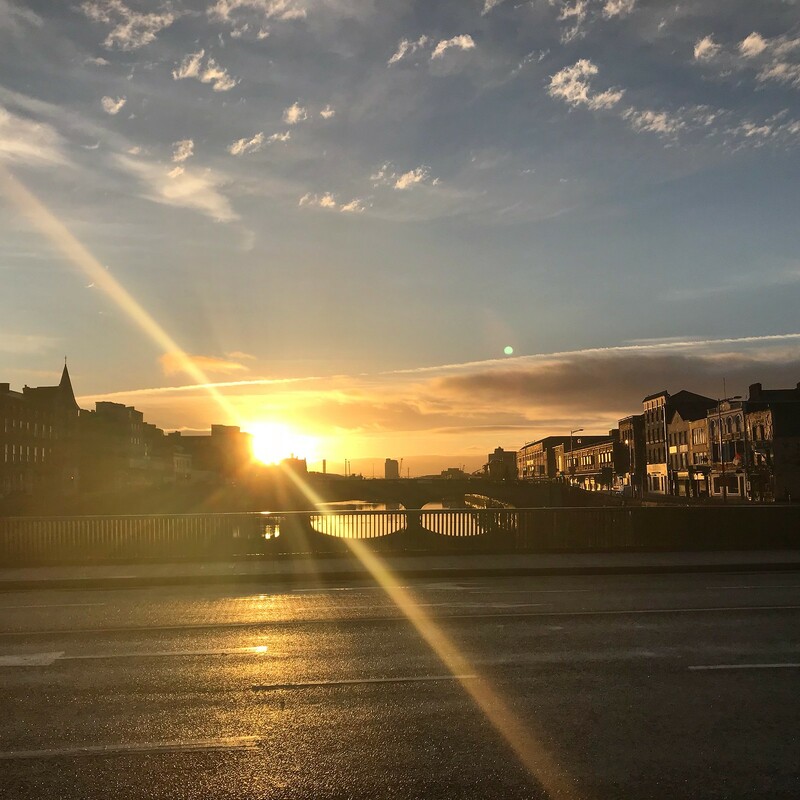 In slight desperation, wondering what to do next, I asked Mr. Waffle to check a list of 17 hidden exciting things to do in Cork he found on the internet. One of them was feed the ducks in the Lough. I mean, I’ve no objection to feeding the ducks but I wouldn’t exactly call it exciting. We had about an hour and a half until Mr. Waffle was meeting a friend for coffee and I almost suggested going home (to be fair, it was lashing) but then I had a mild stroke of inspiration and we went to see Elizabeth Fort and the Protestant cathedral. Elizabeth Fort boasted mildly exciting views and an air raid shelter which I don’t remember seeing before. 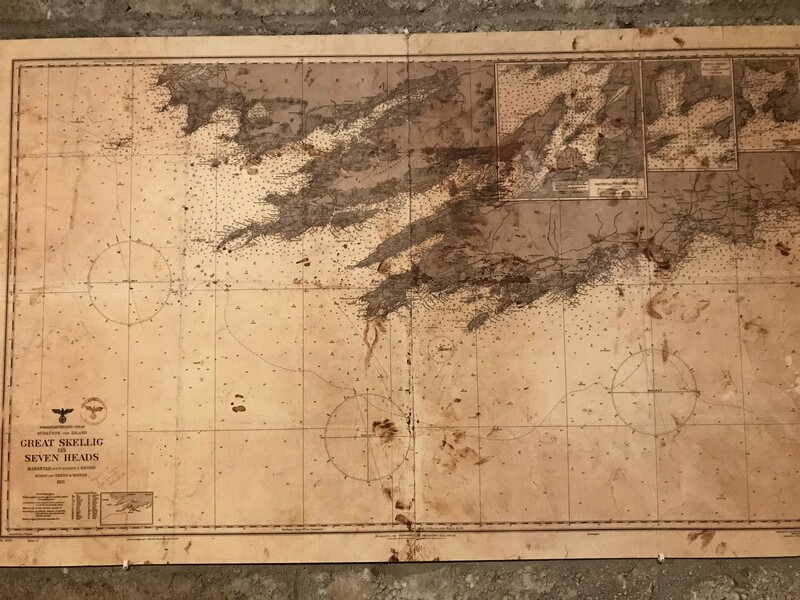 It was extremely damp and had a random collection of cold damp objects for viewing including this slightly alarming map. I quite like the cathedral although I am not generally a fan of neo-gothic. Mr. Waffle wondered about the candles and the IHS on the altar. “Maybe they are very high church?” I offered. “Not in Ireland,” he said firmly. 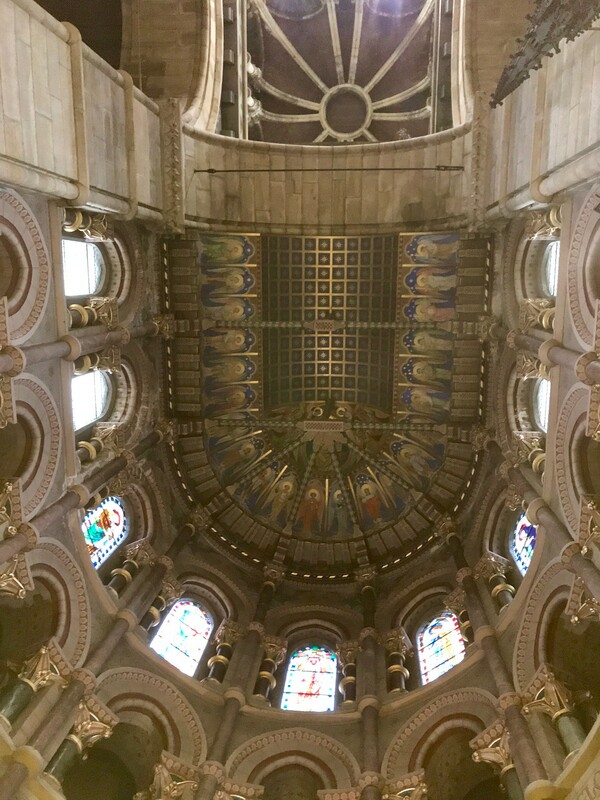 He said it was the least Protestant looking Protestant church he had ever been in. 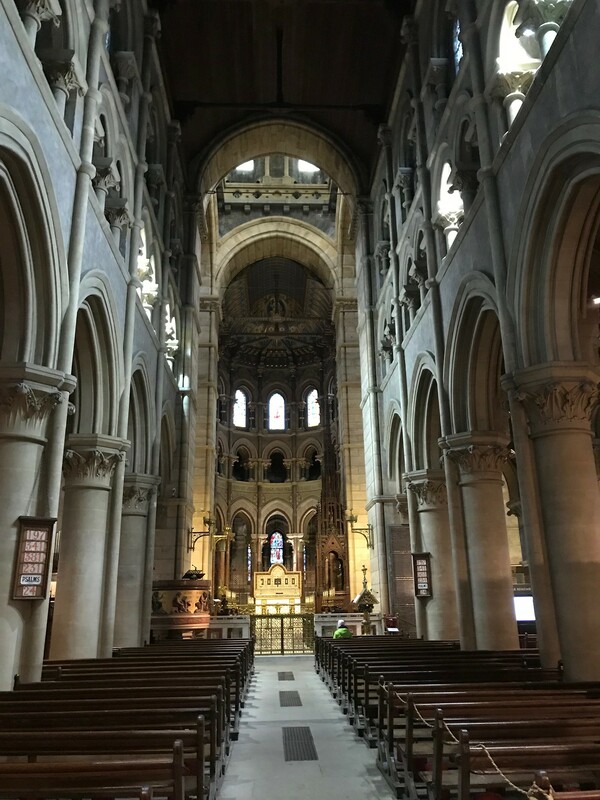 I wonder was he misled because Ireland is basically full of 19th century neo-gothic churches that are Catholic and there are inevitable stylistic similarities. It’s a mystery. That evening, the boys played board games with my sister and her partner and had a fantastic time. We drove back on Sunday morning. It was actually a really good idea to go in the end. We all had a lovely time. It turns out that despite the cynical words of my son Michael on another occasion, there is such a thing as fun for all the family. Saturday saw the usual drama/football dropping off with a side trip for Mr. Waffle to visit his father in hospital. My sister came over on Saturday afternoon to give the boys their birthday presents which were very well received indeed. She also advised me on my kitchen renovations (only starting in November almost certainly will not be finished by Christmas despite the builder’s blithe assurances to the contrary). She found a dead mouse on the utility room floor (the cat is in overdrive) and instead of closing the door and waiting for Mr. Waffle to return, she took it out to the garden on the dustpan to dispose of it. “Where did you put it?” I asked nervously. “The compost heap,” she said. I was outraged and made her go out and rescue the corpse with a tongs. Then she took it to the lane. I was keen that she throw it over the wall on to the building site from whence, I am convinced, it came but she was unsure that she would be able to get it over the wall and felt unable to run the risk that it might not clear the wall and would rain back down on us, so laid it in the lane underneath some foliage. After that excitement, she went into town to see an Irish language play. Her partner’s mother was the playwright – he comes from a very literary family. They came to our house afterwards for a cup of tea. I have to say, the playwright is a lovely woman and I felt a bit guilty that we hadn’t attended ourselves but she did not seem at all offended. A low point came as I handed round the plate of biscuits and Daniel said, “No, she can’t have those, they’re the book club biscuits!” It is true that I am up to host book club on Monday and I had indeed bought the biscuits for this purpose and previously forbidden Daniel for eating them on those very grounds but this was not the moment to bring it up. After they left we went next door where they were having their annual end of summer party. Among the neighbours is a man whose father, I had heard, delivered the little old lady across the road. In fact, chatting to him about this, it turned out it was his grandfather – an awkward moment I have to concede. He is a bit older than me but, it turns out, not that much older than me. I had thought all the families were local to the area but in fact she was born in Carlow where his grandfather lived and worked and he was from Tullamore and it was complete coincidence that they turned up living across the road from each other. I also found out that Mrs. Second Next Door is a sister of Mrs. Directly Across the Road. Yes indeed, Ireland is tiny. Getting back to the man whose grandfather delivered the little old lady who lives across the road, he told me that his wife wasn’t there as she was at home minding their daughter. Ever mindful of my own daughter’s pecuniary needs, I offered her up as babysitter for a future occasion should there be a need, once she returned from France. At this he looked a little sheepish. It turned out that their daughter, who does look very young, is only 18 months younger than ours but that her parents are very protective. He pointed out that she is the only child of older parents and, there we have it, another awkward moment. The next person I spoke to was another neighbour, a lovely man, whom I had met in a slightly heated work context earlier in the month. Between one thing and another, I ended up leaving early to mind the [sleeping and entirely indifferent] boys next door with something of the mien of a coursing hare. The question which is agitating the world today is a social one. It is a struggle between those who have nothing and those who have too much. It is a violent clash of opulence and poverty which is shaking the ground under our feet. Our duty as Christians is to throw ourselves between these two camps in order to accomplish by love, what justice alone cannot do. I have to say that I thought that it was a contemporary source but no, it dates from the first half of the 19th century. Ozanam (I learn from this morning’s leaflet at mass) was a lawyer but a reluctant one which may explain why he was unimpressed by what justice alone could achieve. All afternoon we had Daniel and Michael’s friends from school playing elaborate board games – like a birthday party only much less effort. We had our regular scheduled talk with herself this evening. She seems to be getting on like a house on fire in France. I hope that she’s not putting on a brave face but I think not. She got my latest letter and hasn’t read it all yet and I don’t get the sense that she’s saving it up. I think that’s a good sign though slightly disconcerting. I face into a week of book club hosting, football training for Dan, parents’ council AGM, return of Mr. Waffle’s weekly soccer club and kitchen appliance inspection (you have to BOOK to see kitchen appliances now). I’m feeling a sense of anticipatory exhaustion. I plan to spend the evening re-reading Terry Pratchett to fortify myself. How was your own weekend? I went down to Cork on Friday to do a tour of nursing homes. My brother was away and it seemed the least I could do to help my saintly sister, though since she ended up having to chauffeur and feed me, it’s hard to argue that my visit was an entirely unmixed blessing. My mother was fine and the nursing home where she lives is near my parents’ house, so reasonably convenient. My father was about an hour away. He is recuperating from pneumonia and given that my brother is away, it seemed best if he spent a little time in respite care. The papers are delivered so it is not all bad but I wouldn’t say it is delightful, now. He’s a bit bored and keen to get home, however, this meant that he was gratifyingly pleased to see myself and my sister. I now chat away to him with a view to finding out about ancient history. “What was it like when the first colour films came out, Dad?” “Well, you know, very exciting at the time,” he said. Sometimes these chats are more successful than others. I did enjoy his description of when he was a junior doctor in the local hospital in the late 40s and the matron put her head round the door of the elderly patient he was tending to (one of the Colthursts of Blarney Castle) and asked him whether he had enjoyed his soup. Sir George replied, “Very grateful to the stomach, sister.” This is a phrase that my father believes should be brought back in to common currency and who am I to quibble. I left Cork at first light on Sunday morning. Since I thought my train was at 8 and it was actually at 8.25, my rising was even earlier than it needed to be. Alas. On return to Dublin, I lunched with my loving family and scooted off straight to my book club which probably didn’t make me the most popular family member but I understand people say that there is a merit in scarcity value. How was your own weekend? The Pope came to Ireland. I didn’t go last time a Pope came to Ireland in 1979 and I hadn’t intended to go this time but my sister got tickets to the mass in the Phoenix Park and couldn’t find anyone to go with her. Given that I live in Dublin and she was staying with me, it seemed churlish to refuse to tramp to the world’s longest mass. It was fine, actually (though the weather was not); it was nice to go for a long walk with my sister and we had tea to tide us through the mass. The Pope gave his sermon through Italian which was subtitled and I was able to deploy my college Italian to translate as we were too far to see the subtitles on the big screen. Given the age profile of the crowd, I doubt we were the only ones who couldn’t see. It was fine but I was not particularly excited. I’m not a great one for live concerts either so maybe I am just not designed to stand in fields for performances of any kind. By far the most exciting part of the Pope’s weekend in Dublin for me came on Saturday afternoon and had nothing to do with the Papal visit. I had been in town with the Princess on Saturday morning to replenish her wardrobe in advance of her trip to France and retired exhausted before she had been to all of the shops she wanted to cover. I gave her some cash and told her to make her own way home when she was finished. Waiting for the tram to take her home, she saw a stabbing. As she reassured me, it was just the blood she saw really. Anyway, it effectively stopped the trams and she had to go and find a bus to take her home. As I sat in horror listening she reassured me further, “The stabbing was the worst thing that happened to me on the way home.” In fairness, there is something to be said for keeping her safe in small town France for a couple of months. So Christmas day passed off peacefully enough. Herself was displeased with her offering from Santa “Why does Santa hate me?” but otherwise all was well. We went out to the cousins for drinks with extended family but it was just ourselves at home for dinner which I really liked. I am not the world’s greatest natural hostess and I find it pleasantly undemanding when it is only family for dinner. 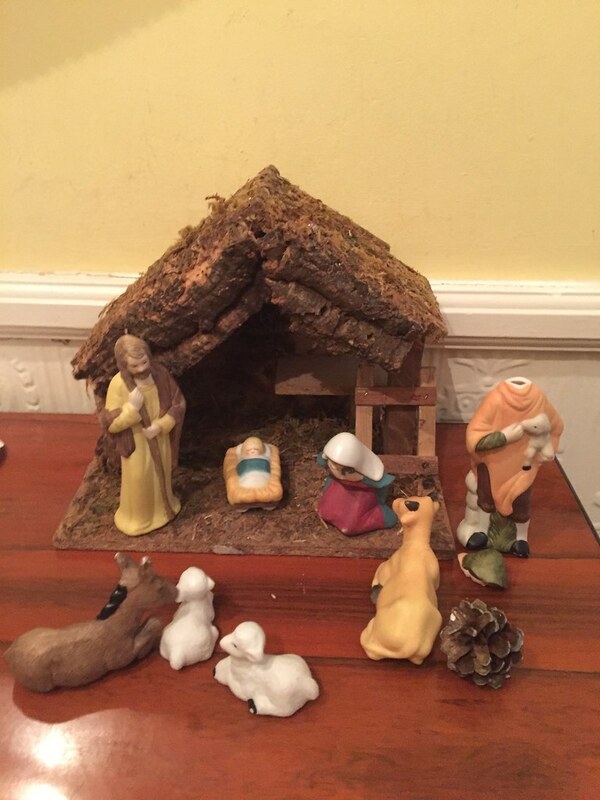 Our crib shepherd lost a head at a crucial moment and so missed most of the big day. He was taken out by a large book on Dr. Who which hit him inadvertently. It was suggested that he might be renamed St. Denis for this year only (his head is now safely superglued back on his shoulders). 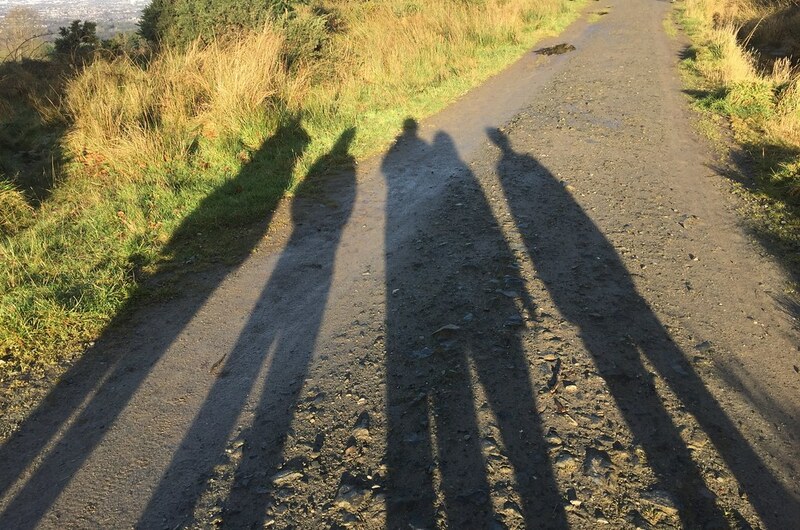 On the 26th we went on the traditional orienteering expedition in the Dublin mountains with the cousins. For the first time ever, as far as I can remember, it did not rain. That evening, herself went as emergency babysitter to the three year old child of friends who live around the corner. It went very well and she sees a lucrative new income stream opening up. 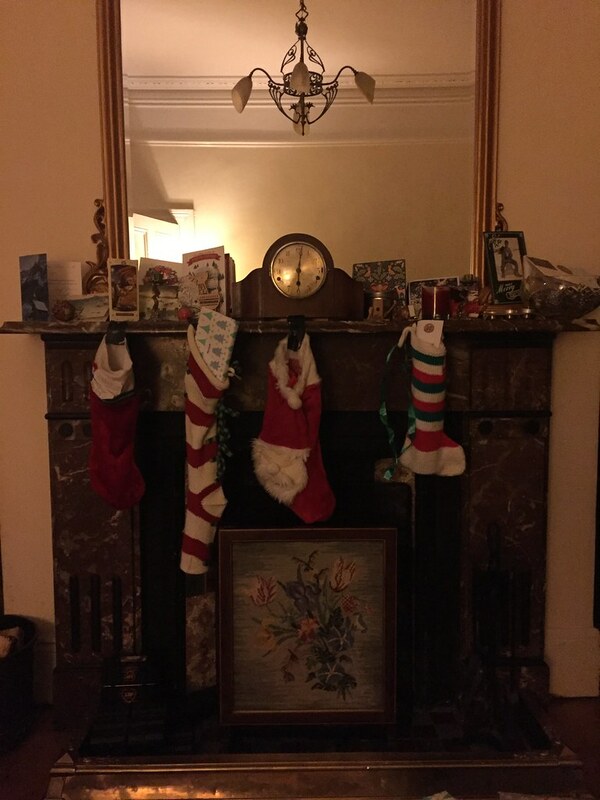 On the 27th we went to Cork where a vast array of exciting presents awaited. 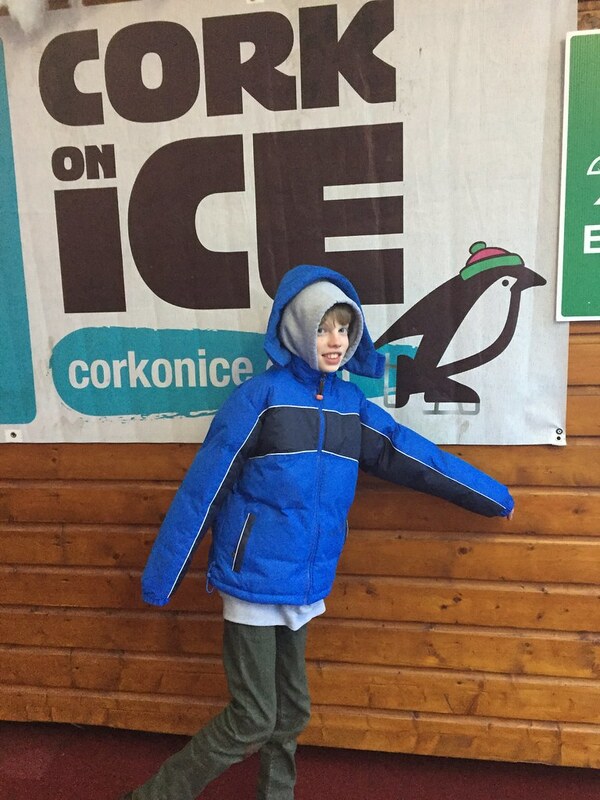 We stayed in our friends’ place in East Cork and went up and down to Cork city for various excitements including ice skating. We did the Ballycotton cliff walk which was spectacularly muddy. We ran into another family; the mother was American and was walking along with a child in a sling and the father was Irish and admiring the view. They also had a two year old splashing through an enormous puddle. Her mother kept begging her not to run through the puddle; advice which the child ignored with unfortunate but not entirely unexpected consequences. I felt very sorry for the child and her mother. I did think her father was quite useless. Herself has urged me not to be so judgy but I said, “I bet your grandfather was better than that in the 1970s.” When we checked at her insistence, however, he indicated that he too would probably have looked at the view. I refuse to believe that. Like his granddaughter, he is not judgy (other than about politicians, oh my goodness, lots of judgements there) and I feel he just wanted to exonerate the father from blame. I digress. 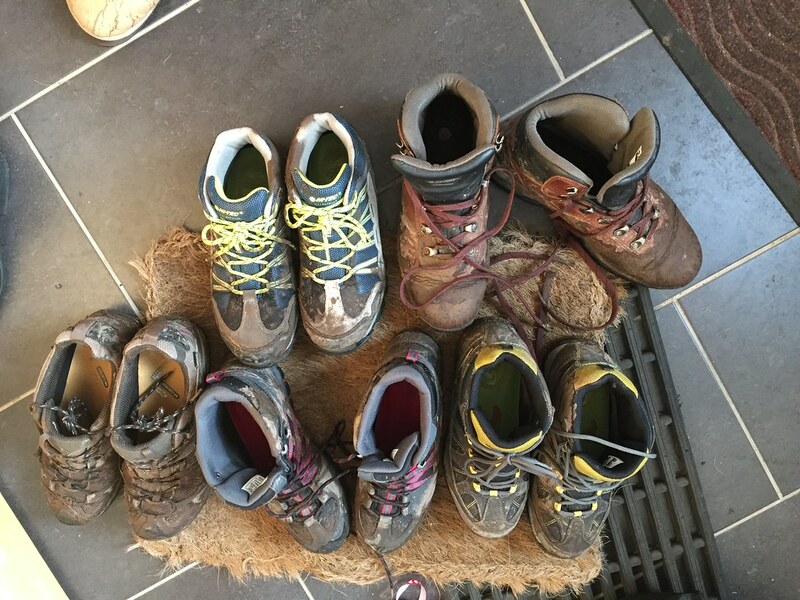 Thanks to our new boots and greater height and motor skills than the average two year old, we remained dry. That evening, my sister and her partner took the boys to the new Star Wars film and dinner in Milano’s. Herself, Mr. Waffle and I went for a more sophisticated dinner option together which she quite enjoyed (she tires of Milano’s but her brothers never will). 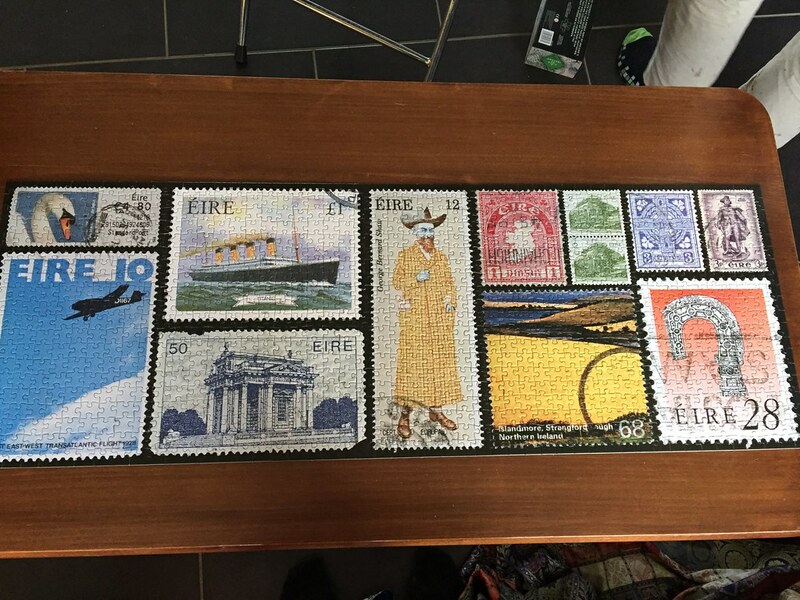 We finished our Christmas holiday jigsaw. Almost unbearable excitement, I know. The house in East Cork has no television or wifi which I really enjoy. The children, slightly less so, though not as much less as you might imagine. We were back up to Cork the next day where my brother and sister made a very elaborate family dinner for ten where the Yorkshire puddings were a highlight for Daniel and Michael. My brother bench pressed herself; this is the kind of quality entertainment that is available at family dinners. My father told us about his first meeting with my grandfather, his father-in-law to be. My mother went off somewhere with my grandmother and he and my grandfather were left to cope alone. My grandfather asked him whether he would like a drink. He would. At the time, my grandfather was going blind and after rooting around the cupboard, he emerged with a bottle of whiskey and poured out a measure for my father. He didn’t take any himself. My father who was a keen whiskey drinker was pretty sure that the contents weren’t whiskey but pretended to drink filled with fear that it might be some terrible poison – my grandfather was a farmer and farmers are or certainly were, inclined to fill random bottles with agricultural supplies. When my mother and my grandmother came home, investigation proved that the non-whiskey drink was actually Lourdes water. Also on herself asking him about living in American in the 1920s (long story, he did), he recollected turning off all the lights in the house commemorating some anniversary of the lightbulb. It must have been quite the shock coming back to Cork with its oil lamps in the 1930s. He also was quite adamant that it snowed while they were in America, given that they were living in Orange County, South Pasadena (apparently the South was important), that seems a little unlikely but he is adamant. That night, we had games night – Michael got a number of games for Christmas and he was keen to try them out. It was actually quite good fun though slightly hideous in prospect. On new year’s eve we went for our first walk on the beach since arriving. It started to lash rain/sleet and we ran to the hotel hoping that it might give us lunch but, sadly, no. Mr. Waffle and herself braved the rain and got the car and we went to the Kilkenny shop in Shanagarry instead. We met a good friend of mine from Dublin there with her family which was quite random and proves that Ireland is tiny etc. 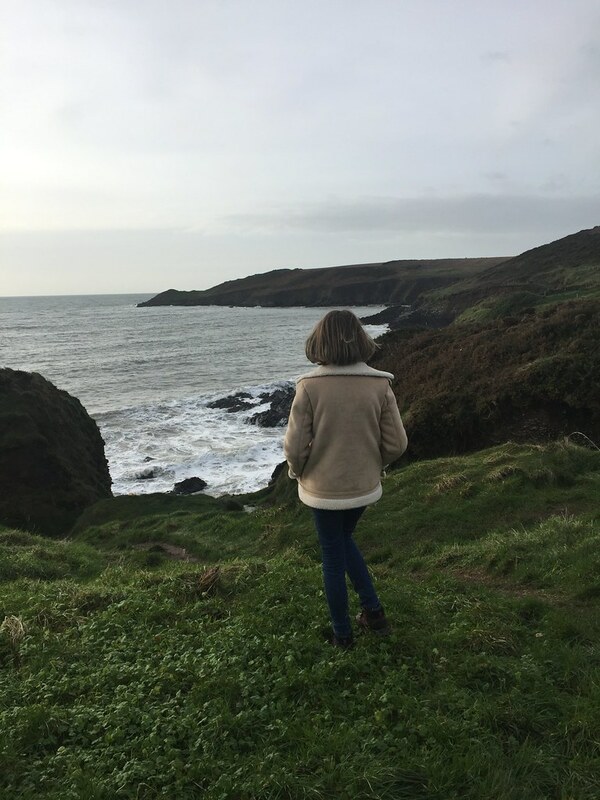 She and her family were reliving her husband’s childhood family holidays in Waterford and their exploring had taken them into East Cork. Then back to Dublin. We bought a “Best of Queen” CD and a 5 set CD of hits from the 80s to listen to on the journey (mock, if you will). I can confirm that Queen had more lasting hits than all of the 80s put together. About half way back I started to feel unwell (unrelated to the hits of the 80s). By the time we got home, I was very unwell. I spent the remainder of the evening getting sick and could only lend half an ear to the various woes involving the cat (neighbours had wrong keys, had gone out and bought cat food and sent their teenager over the garden wall to put out cat food for the cat every day, frankly, above and beyond the call of duty). About 11.45 in a brief break from my time in the bathroom, I headed downstairs to wish Mr. Waffle a happy new year. He was just heading off to rescue herself from a new year’s eve party. All in all, we have had better starts to the new year. I finally stopped throwing up about 3 am. I firmly blame the grilled brie in the restaurant where we had lunch for my brief but violent illness. The next day, feeling delicate, I was sitting reading the paper while the boys played their new videogame (Overwatch, very popular), “I am a one-man apocalypse,” hissed the character on screen. Herself lent across the sofa and said to me, “It’s the brie speaking.” Oh yes indeed. Mr. Waffle’s sister, husband and baby came to Dublin from London for a couple of days at the start of the month. We had them round for an extended family lunch before I trudged dismally back to work last Thursday. 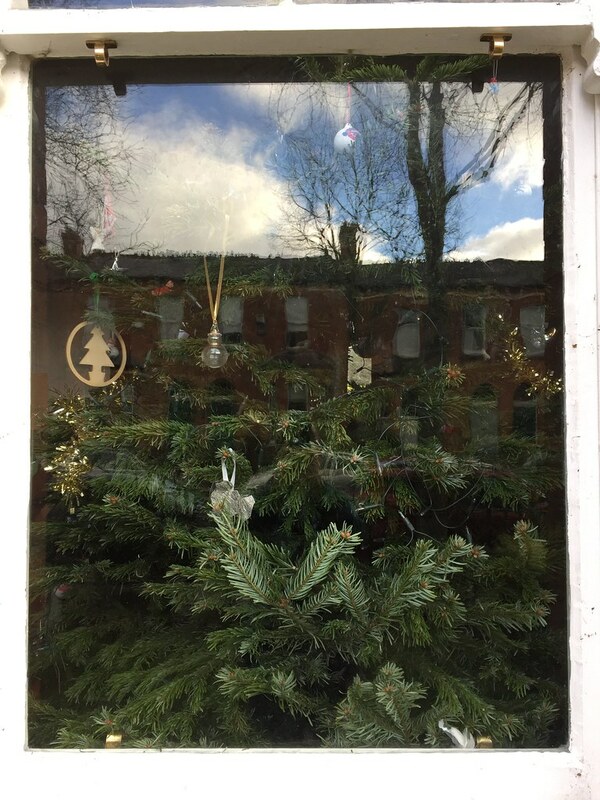 We had the tree yesterday for Women’s Christmas but it came down today and the children are back to school tomorrow. Alas alack. In other news, over the Christmas holidays, Daniel and Michael lost a tooth each. Seriously, when do children stop losing teeth? I think herself still has some to go and she’ll be 15 in April. How was your own Christmas?